How does social media make you feel? Do you ever make a Facebook, Twitter or Instagram post and then keep checking the likes, favorites, and retweets? Are you annoyed by selfies, yet take many of your own? How great do all those birthday wishes on Facebook feel? And don’t you wish people would just stop posting about their fabulous vacations and engagement rings!? Social media is a great way to keep in touch with friends, share good news and network for business. However, there is a dark side to social media. 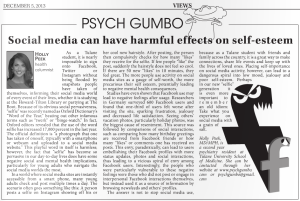 Check out my latest article in the Tulane Hullabaloo!